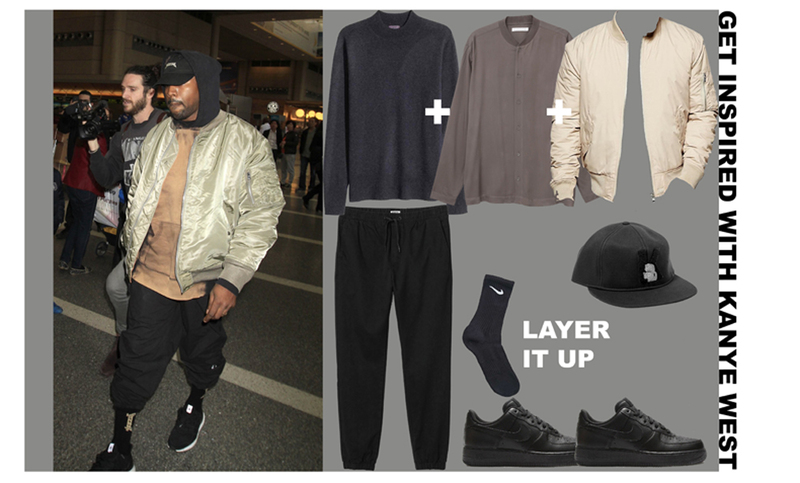 Get Inspired by Kanye West and layer like a pro; we’ve searched the high street and created his look for less. I love Kanye West’s style; he does layering like a pro with the best use of tonal colours. I though this outfit was very casual and comfy, and what more to ask for than casual and comfy? He manages to keep it very cool and I love this! I wanted to re-create the look using high street bands so that more people are able to steel his style. I found both the black trousers and light brown button up shirt from an online story called Weekday. If you haven’t already checked out Weekday, then you must!! Its one of my all time favourites. I wanted to keep the layered look and so chose this cashmere jumper from H&M and beige bomber jacket from ASOS. I chose 3 neutral colours as when layering you can’t go wrong with this colour combo. Unbutton the shirt slightly at the top and bottom for an even cooler look, this way the jumper will be slightly visible at the neck and trouser line. I then chose a pair of black Nike socks (found on Urban Outfitters) which I would tuck the trousers into; who says we can’t relive our primary school fashion? To finish off the look I added an all black pair of the Nike Air Force 1 trainers in Leather and a Black cap with a small imprint of Karl Lagerfeld in the centre. Karl is such an iconic figure and I though this instantly made the outfit look more expensive. Plus, Karl is such a cool guy why would we not want him on our clothes? If you want to try this look then follow the links below for each garment used.